With 2012 well underway, let's start the new year's housing reports with the Southwood real estate outlook. Sporting the most active subdivision in Tallahassee, our Southwood real estate report is a natural "first of the year" look at the activity in the Tallahassee real estate market. Currently, there are 48 homes for sale in Southwood and hundreds more in the shadow inventory, so we expect Southwood to remain at or near the top of the list of most active neighborhoods in Tallahassee. The following interactive map allows you to where the most recent Southwood real estate sales have occurred, and information about each sale. Just click on any red dot for detailed information about the transaction (if you subscribe to the Tallahassee Real Estate Blog by email, you will need to click-through to the website to use the interactive map). 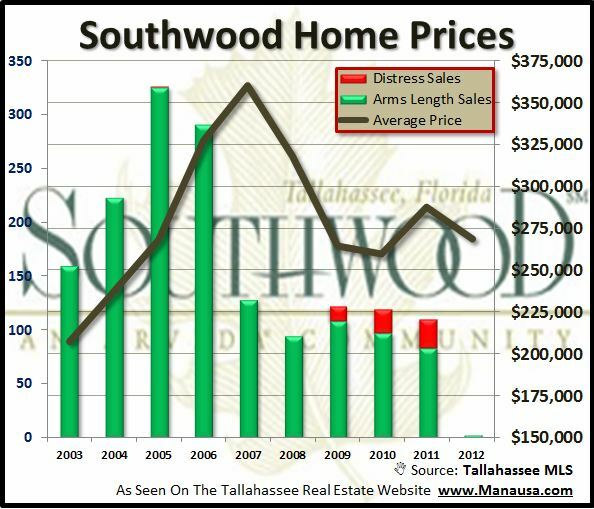 Southwood real estate prices are on the decline, just as we have seen everywhere else in the Tallahassee real estate market. The drop for 2012 is based on only 3 sales, so we'll need more time before we can spot the real level of the trend. Southwood real estate values continue to decline as well. The blue line in the real estate graph below shows the consistentcy of the depreciation in Southwood, and with the new construction of the past three years, we need to keep a close eye on the imbalance between the supply and demand for real estate in Southwood. 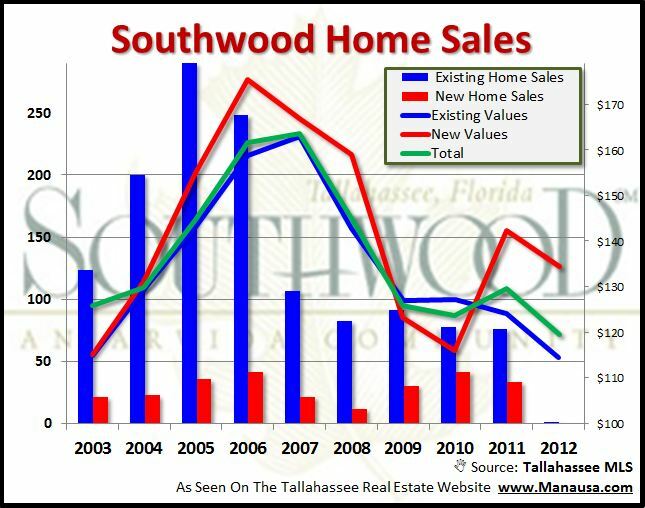 Come back for more reports on Southwood real estate (and other top Tallahassee neighborhoods).